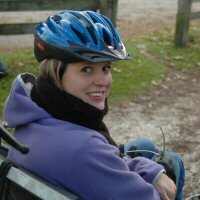 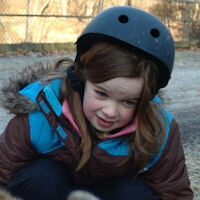 A young rider waits patiently for her Yappy Hour ride to begin. 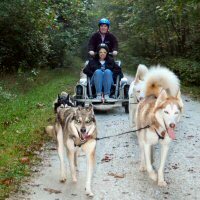 Tours and Yappy Hours: One on one dog sledding and dryland dog sledding programs! 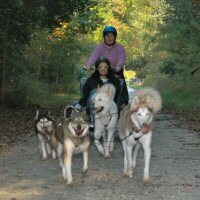 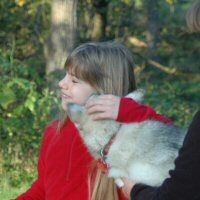 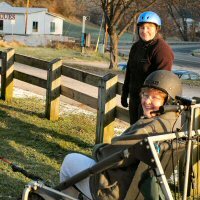 Maryland Sled Dog Adventures LLC's provides one on one tours and Yappy Hour programs. 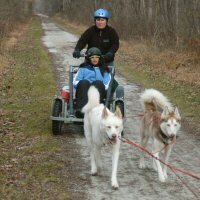 Yappy Hours are designed to give a relatively short introduction to do dog sledding and dryland dog sledding, while the tours are longer and often give the participant a chance to drive the sled or rig. 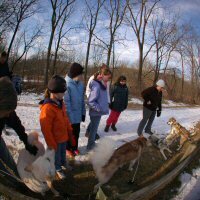 For more information on our tours and Yappy Hour programs, see our Tours page. 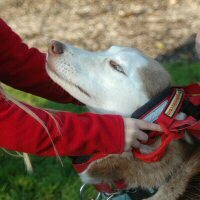 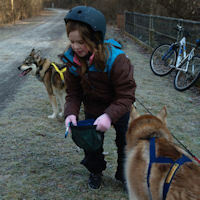 Fiona experienced educational dog sledding at it's best - a Yappy Hour of dryland dog sledding. 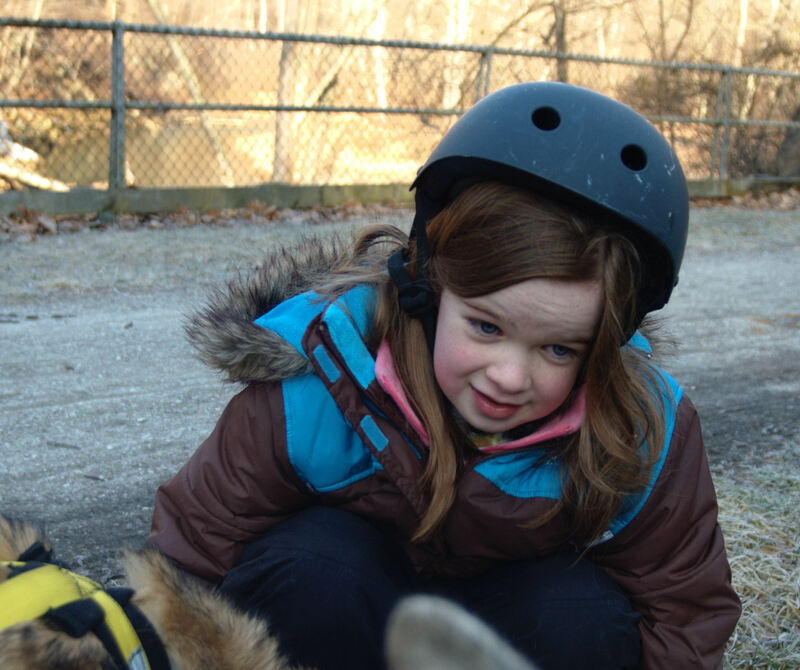 Fiona bonded with the dogs, in particular, with Mr. Sobo. 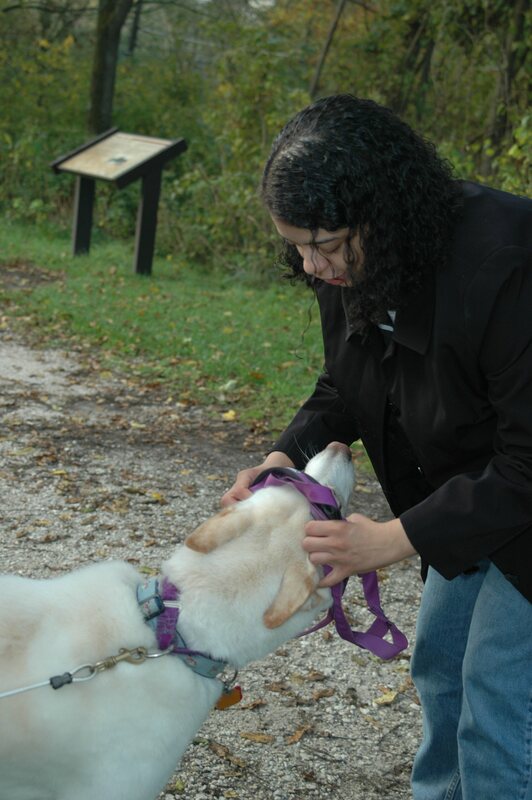 I'm not sure who missed who more- Fiona or Sobo! 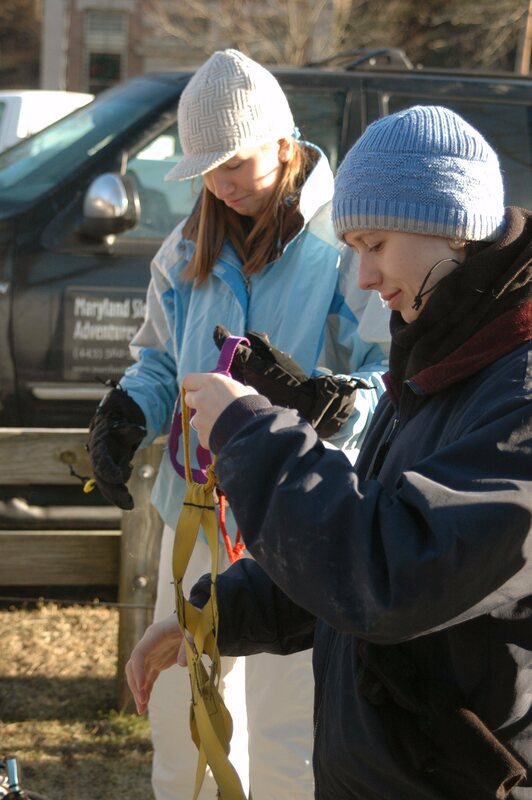 For additional pictures from this program, visit our webshots gallery. 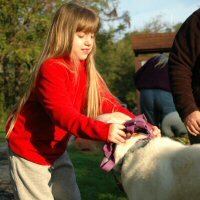 Fiona helps to attach Sobo's belly band. 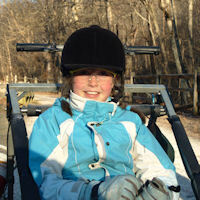 Fiona looks happy to head out dryland dog sledding. 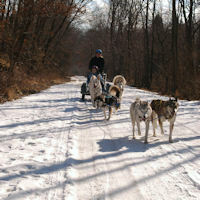 Sled dogs Zoë and Acadia lead the team back towards the White Hall station. 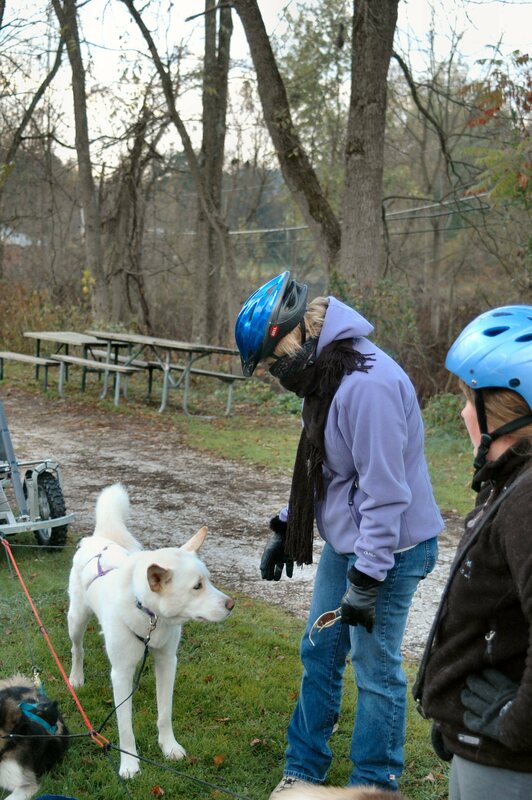 Fiona looks ready to take the team out dog sledding! 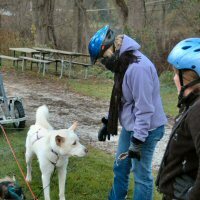 Laura had a special visit from Sobo Claus as she was able to experience dryland dog sledding and the Maryland Sled Dog Adventure LLC team of excited sled dogs. 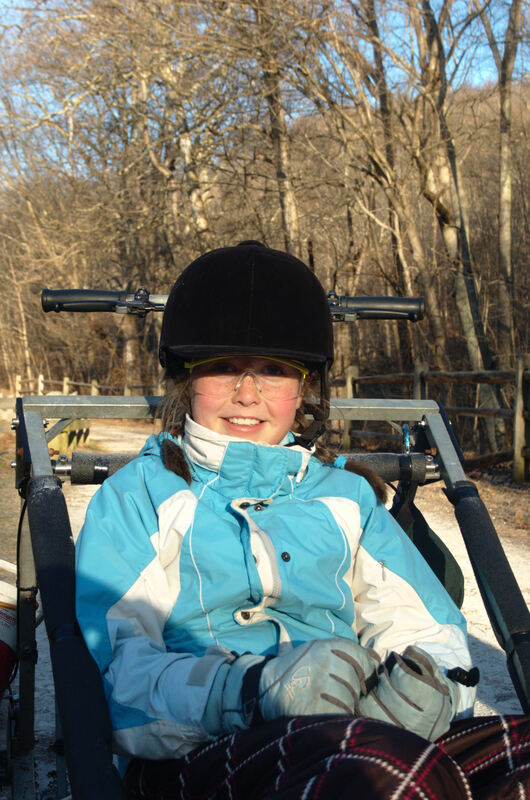 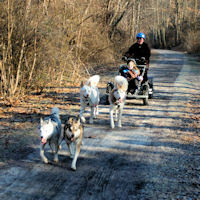 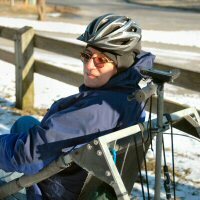 Laura went for an enjoyable dryland dog sled ride through Northern Baltimore county. 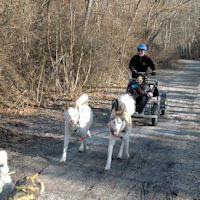 Sled dogs Sobo and Okemo look excited as they run by the camera. 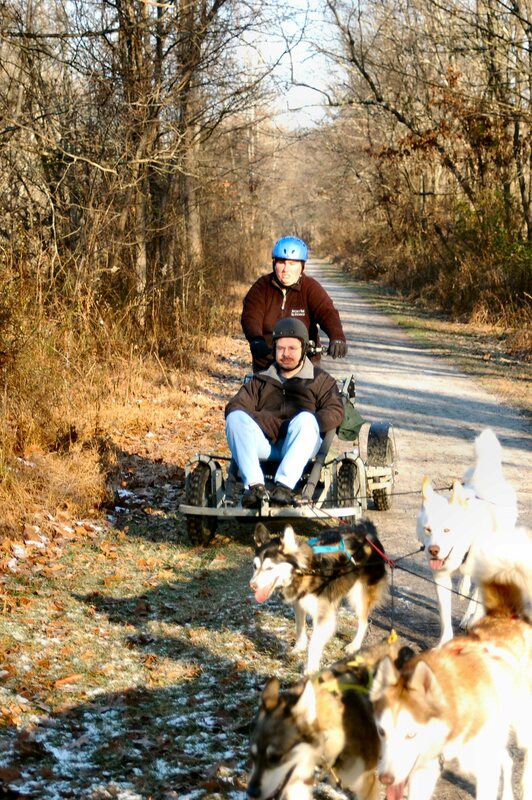 Tim and his intrepid group came out for a day of father - daughter bonding through dryland dog sledding. 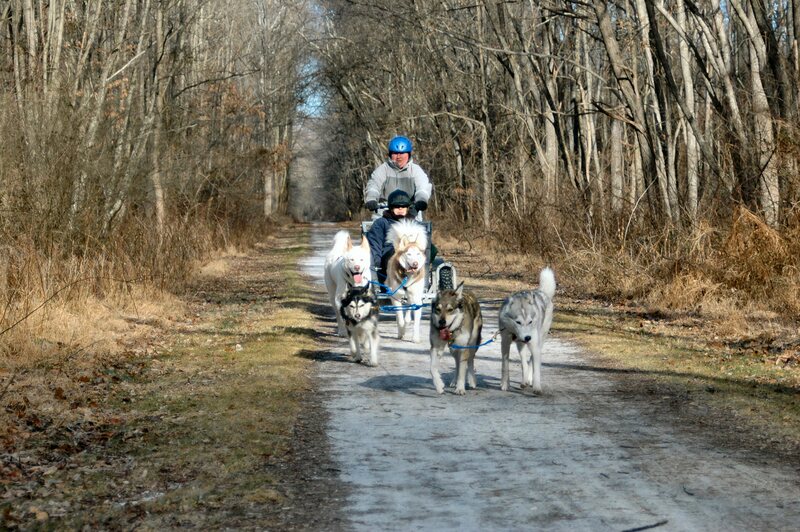 Each of the girls was able to get a chance to experience dryland dog sledding. 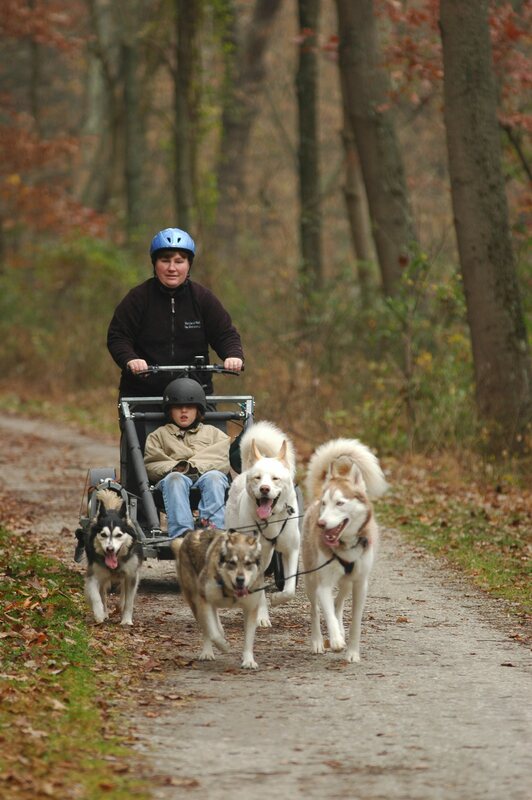 Everyone gets a chance to meet the team of sled dogs. 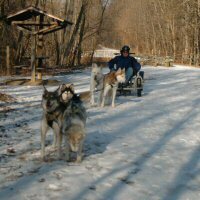 A father gets the chance to meet Okemo. 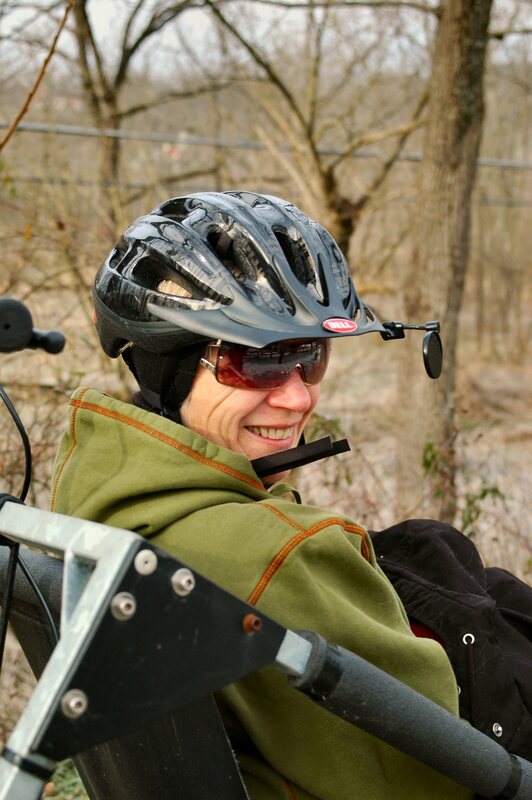 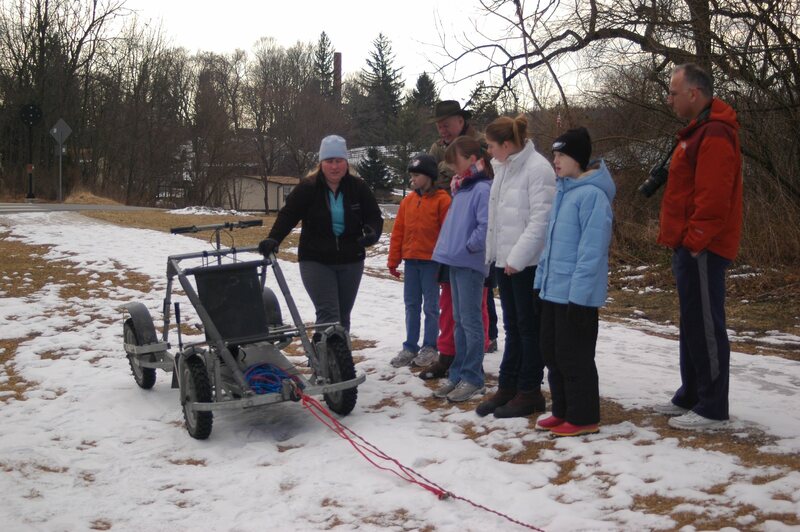 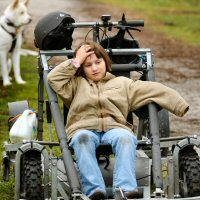 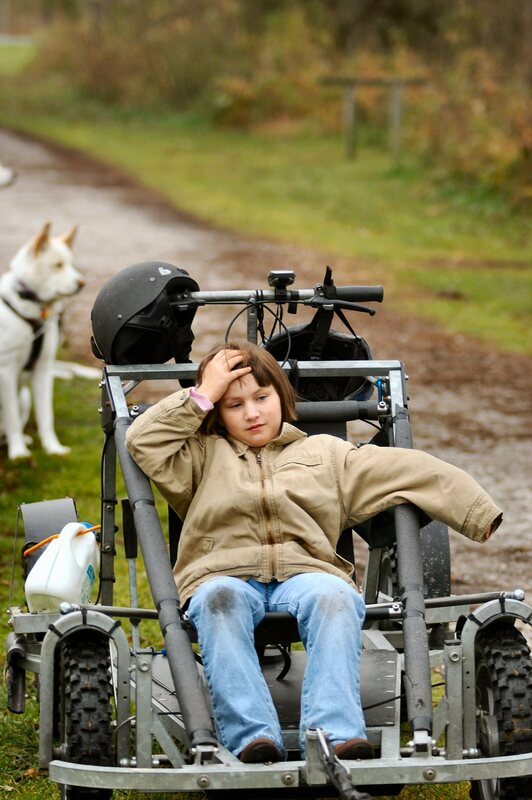 Catherine points out some of the features of the wheeled dryland dog sledding rig. 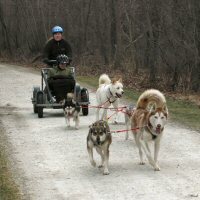 Although there was snow on the trail, the dryland dog sledding rig was used. 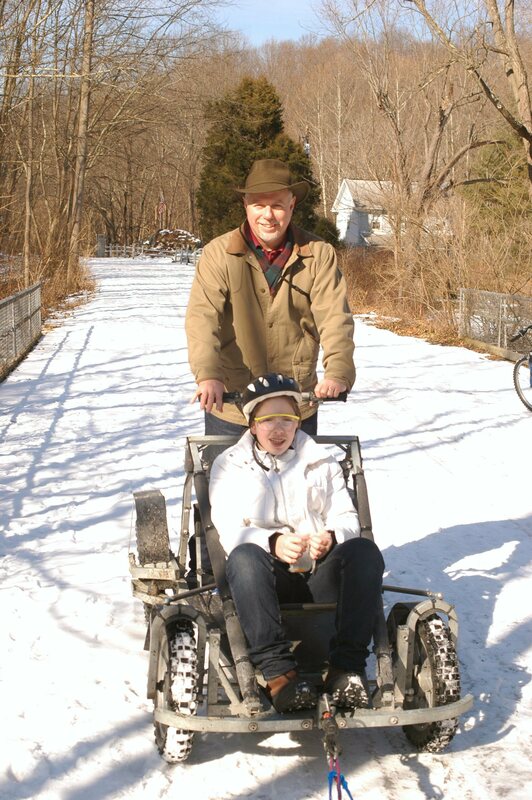 Father and daughter bonding at it's best. 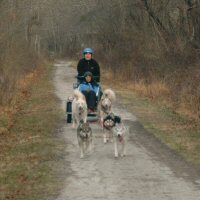 Acadia and Zoë race down the trail. 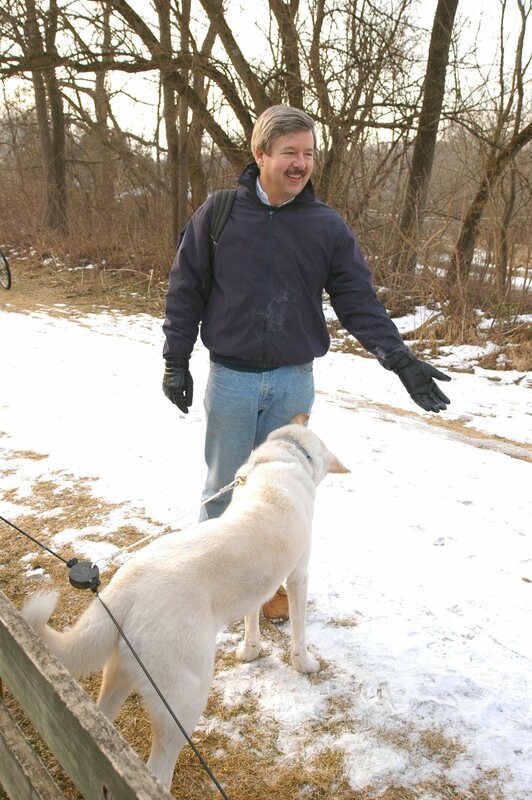 Tom came down to White Hall, Maryland to enjoy a dryland dog sledding adventure. 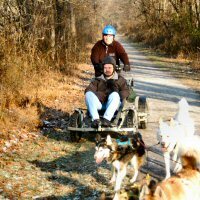 There was a light layer of snow and a chill in the air for atmosphere. 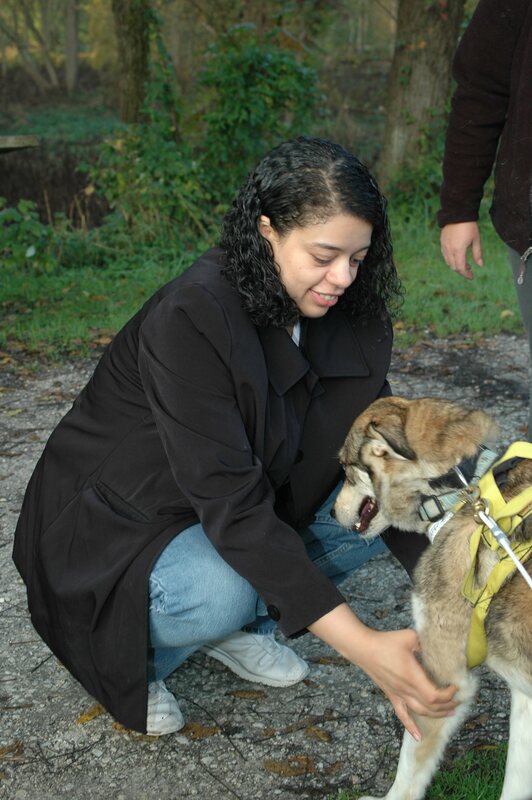 For additional pictures from this Yappy Hour, visit our webshots gallery. 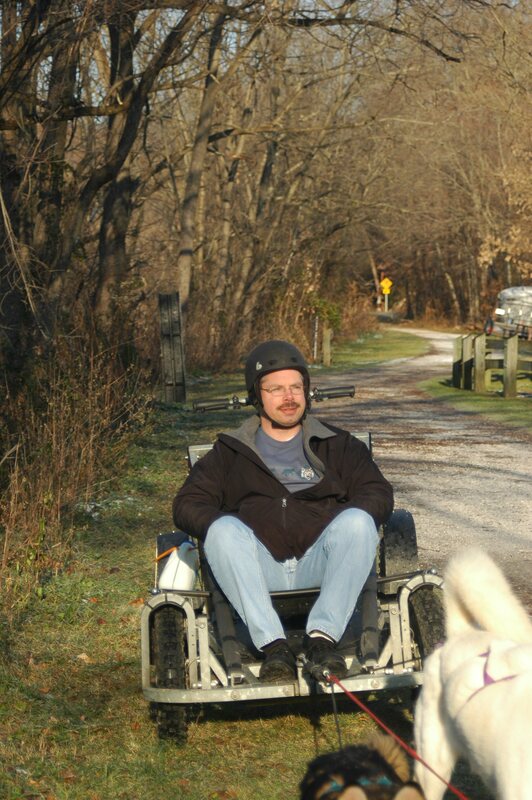 Tom poses from the passenger seat. 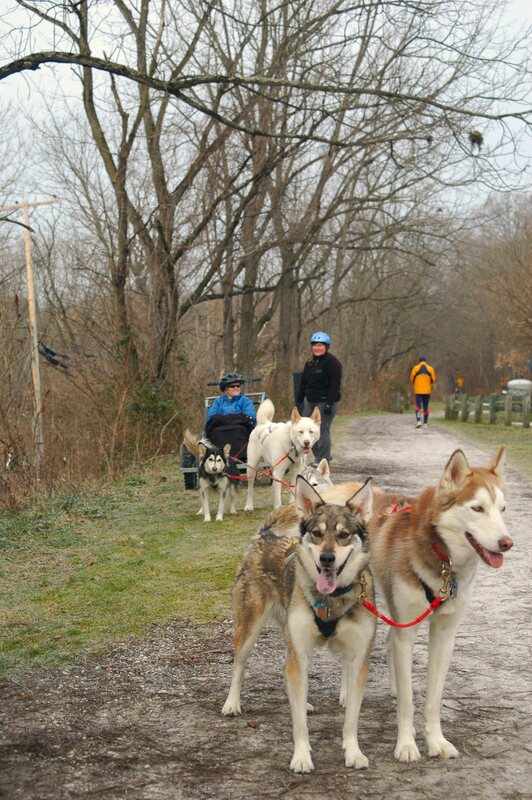 Acadia and Zoë hold the team in a 'line out' at the water fall. 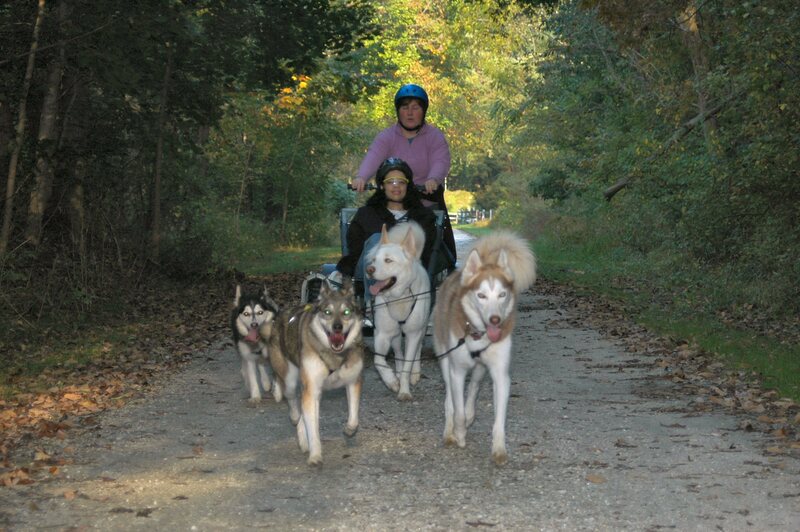 The Frasier family and friends came out to White Hall, Maryland to enjoy Yappy Hours. 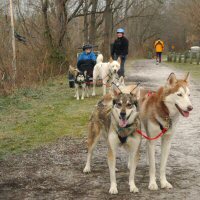 The temperatures were cold, but the dogs were excited to go dog sledding. 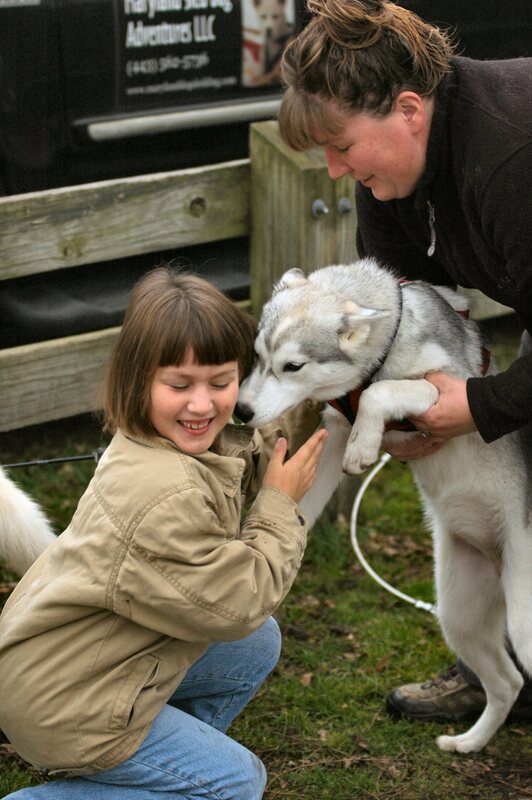 For additional pictures from these four Yappy Hours, visit our webshots gallery. 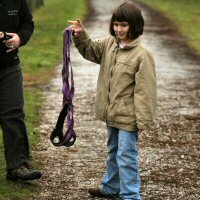 How does this harness go? 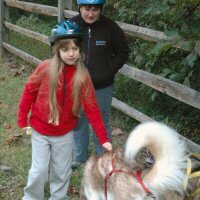 Acadia introduces herself. 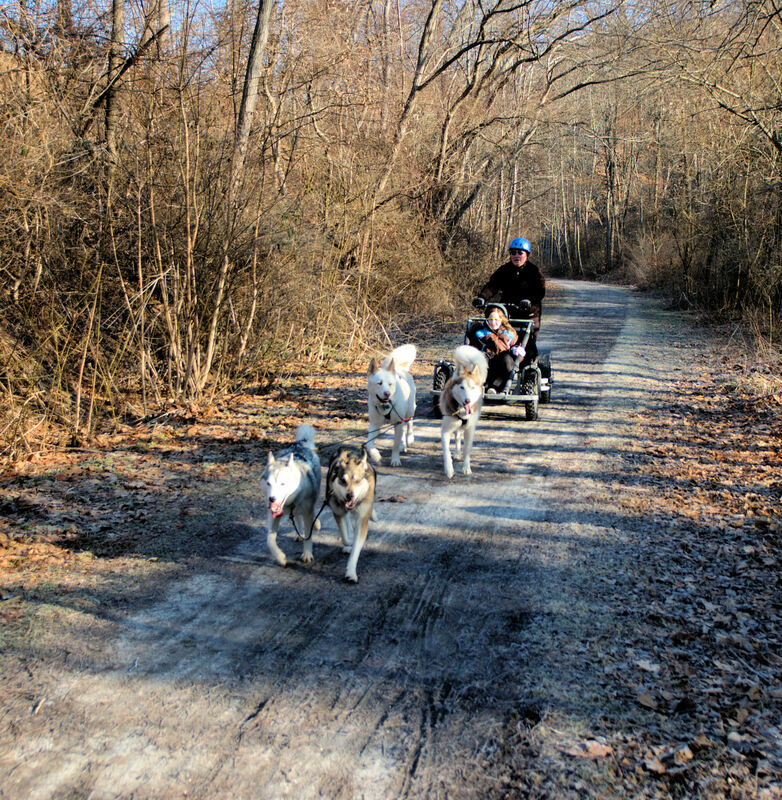 Zoë and Acadia lead the sled dog team down the Torrey C. Brown trail. 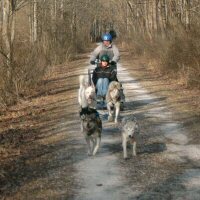 Little Acadia showed her meddle in lead position..
T-Bone's breath froze on his muzzle. 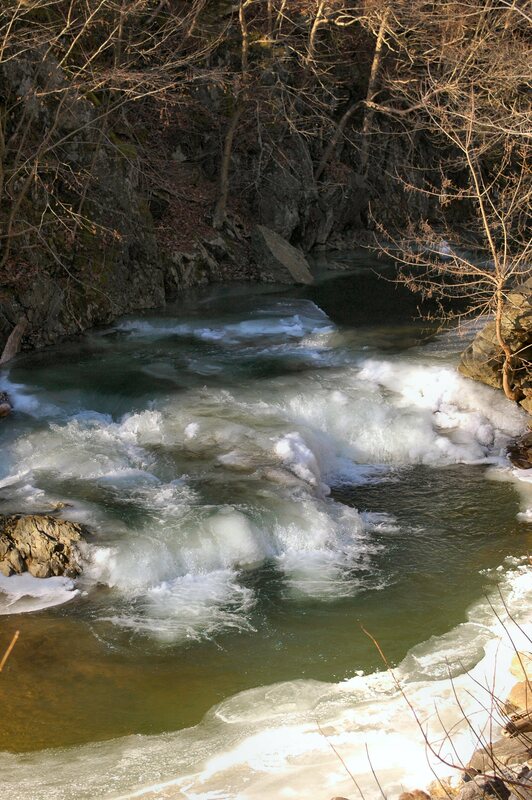 The icy falls provided a dramatic backdrop. 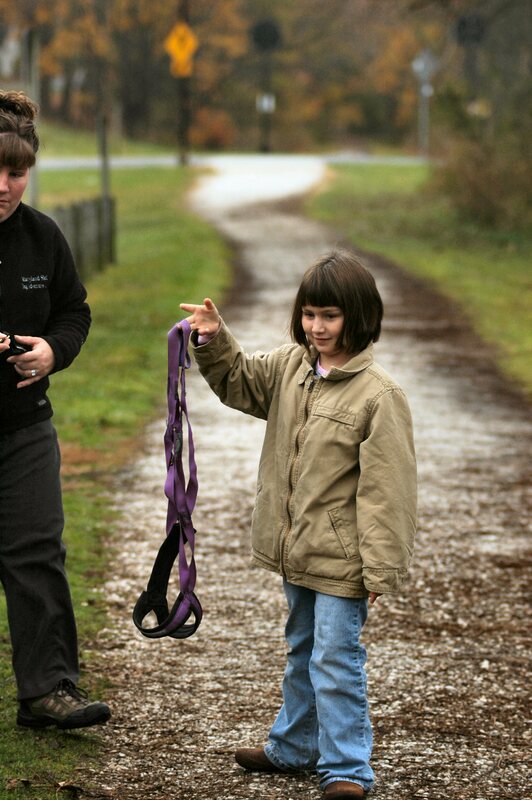 We met Kristen and her family while Acadia the puppy visited Acadia the park in Maine. 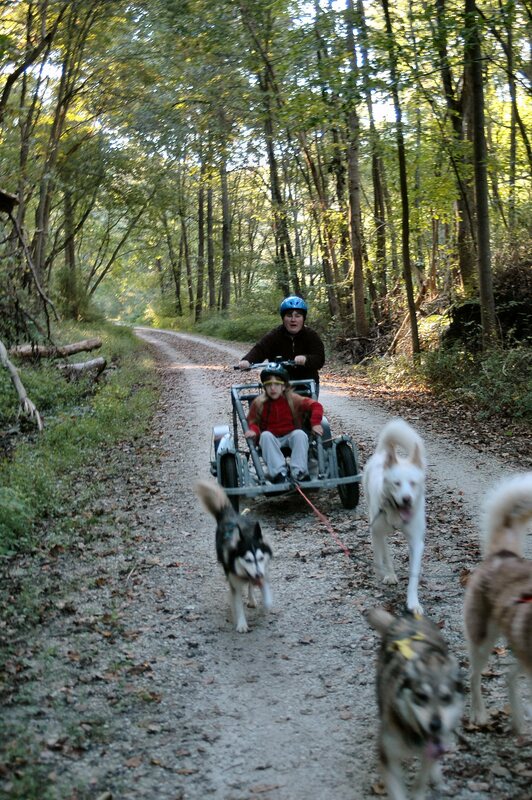 Kristen and her family came from New York to visit family in Maryland and managed to complete the loop, joining with cousins Neal and Andrea for Yappy Hours. 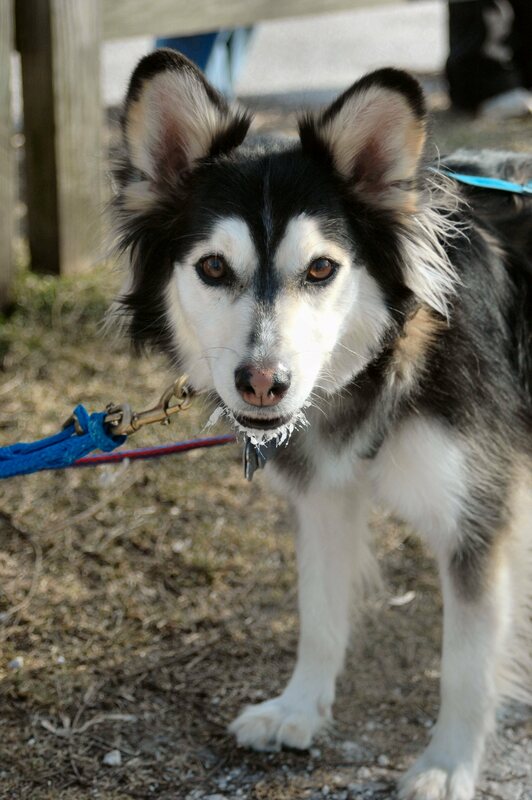 For additional pictures from these three Yappy Hours, visit our webshots gallery. 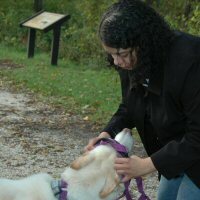 Kristen poses with Sobo. 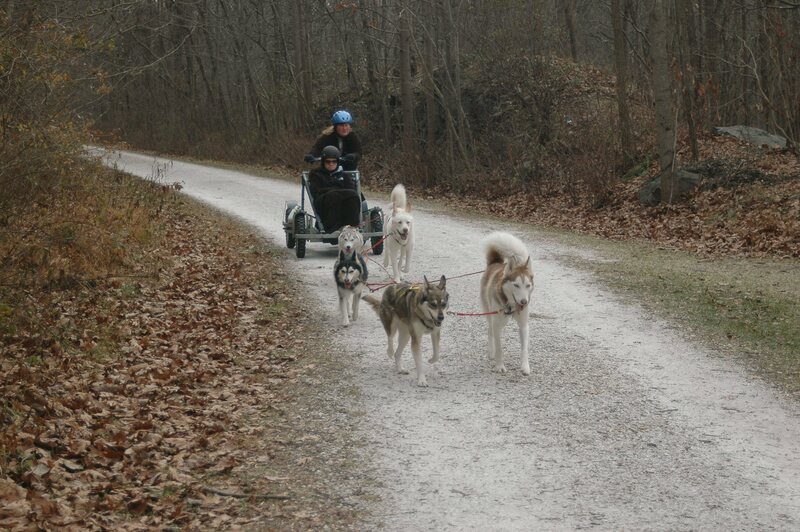 Andrea and the sled dog team race down the rail trail. 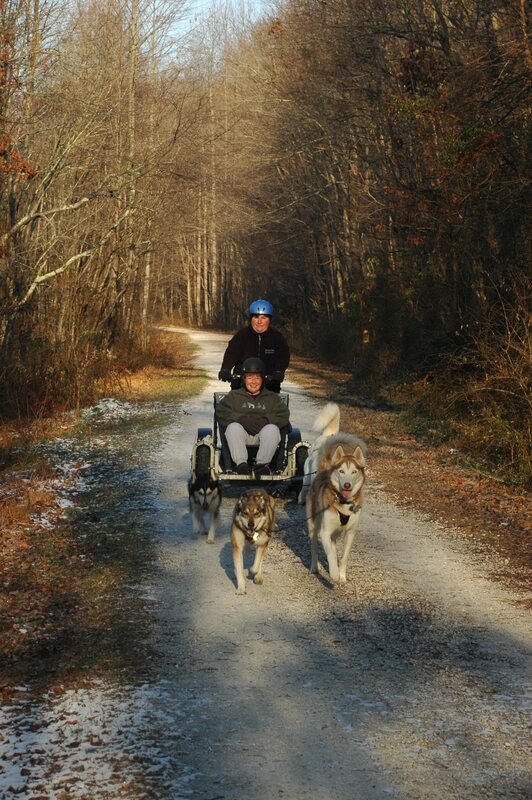 A better look at our passenger and her two wheel dogs, Sobo and Okemo. 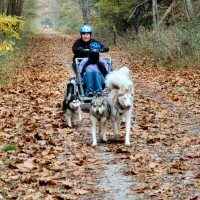 Kristen out with the team of sled dogs, led by Zoë and Acadia. 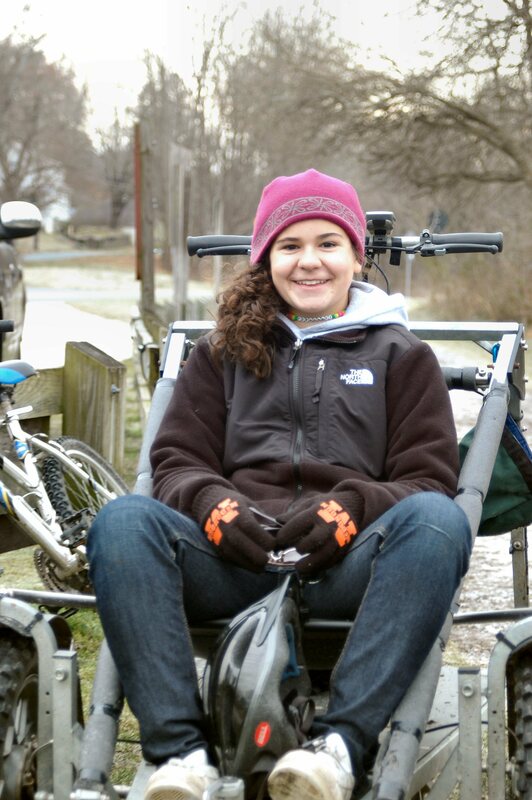 Kristen smiles before dryland dog sledding. 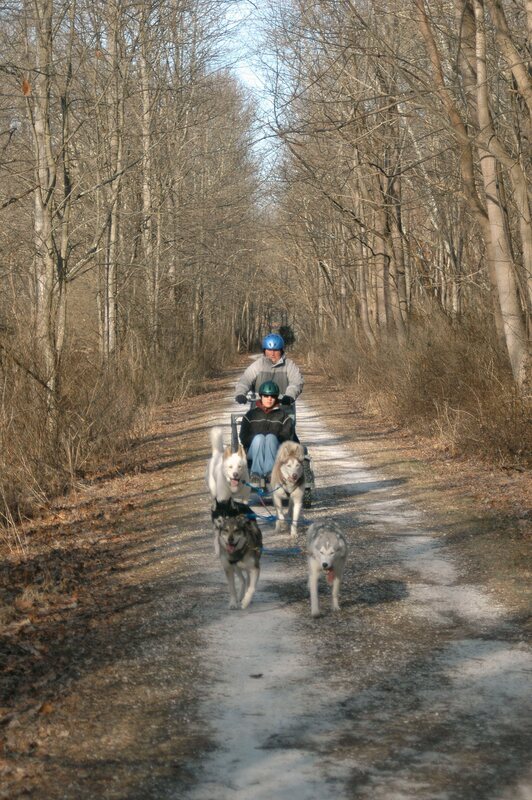 The five dog team pulls the Fritz Dyck rig down the rail trail. 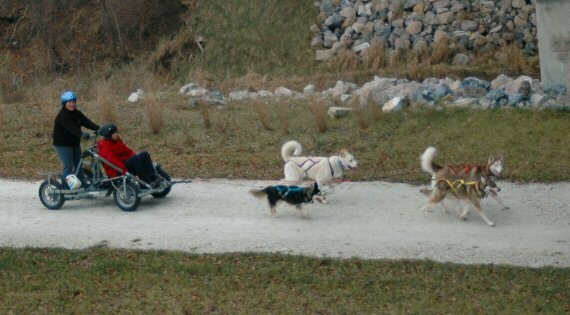 Dryland dog sledding was a family affair that brought adults and teens together, as Bridget, Carol, Karen, and Kelly, came out to the Torrey C. Brown (Northern Central Rail) Trail for dryland dog sledding. 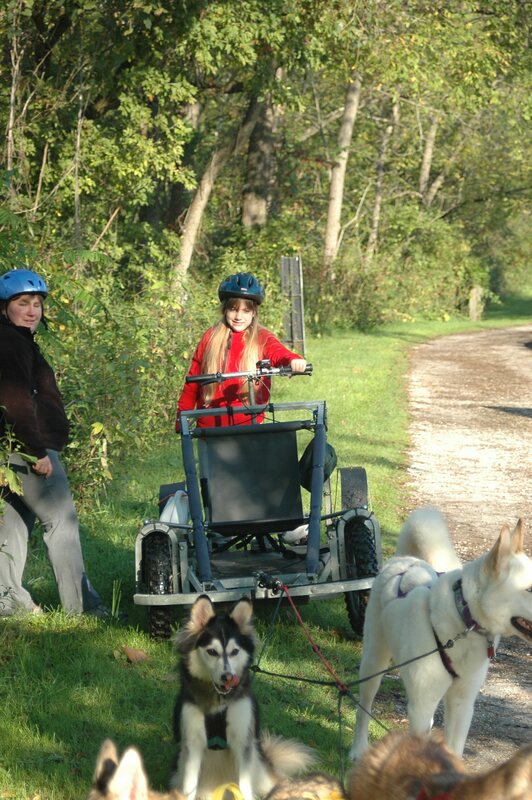 Zoë and Sobo look ready to go. 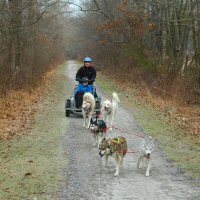 And a few minutes later, it's Acadia in lead. 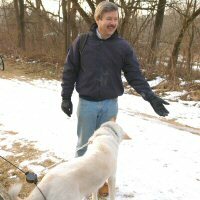 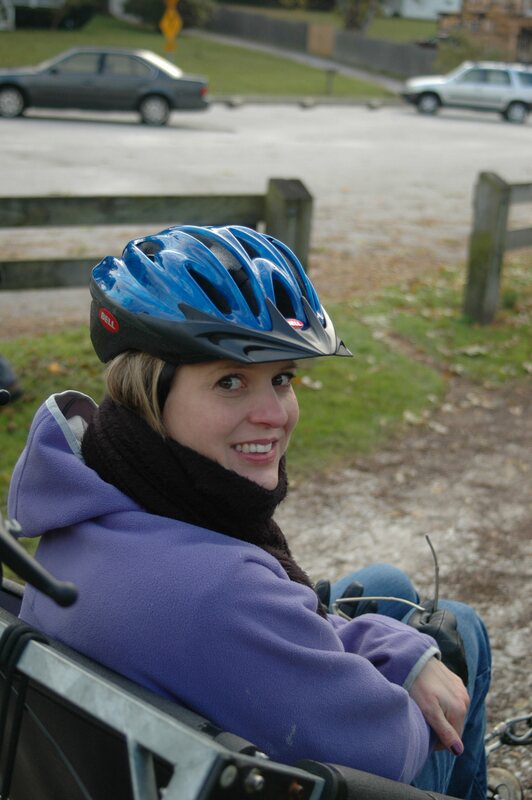 Kelly smiles before dryland dog sledding. 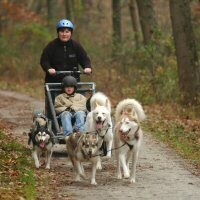 Young Acadia ran in the wheel position during Kelly's run. 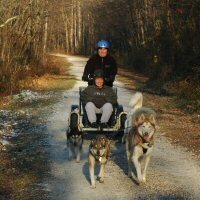 Greg and Deanna, who were formerly owned by a Siberian Husky, came out to the Torrey C. Brown (Northern Central Rail) Trail for some Siberian loving and dryland dog sledding. 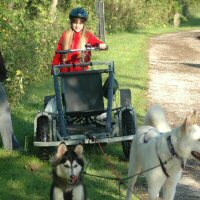 Deanna posing in the Fritz Dyck dryland dog sled rig. 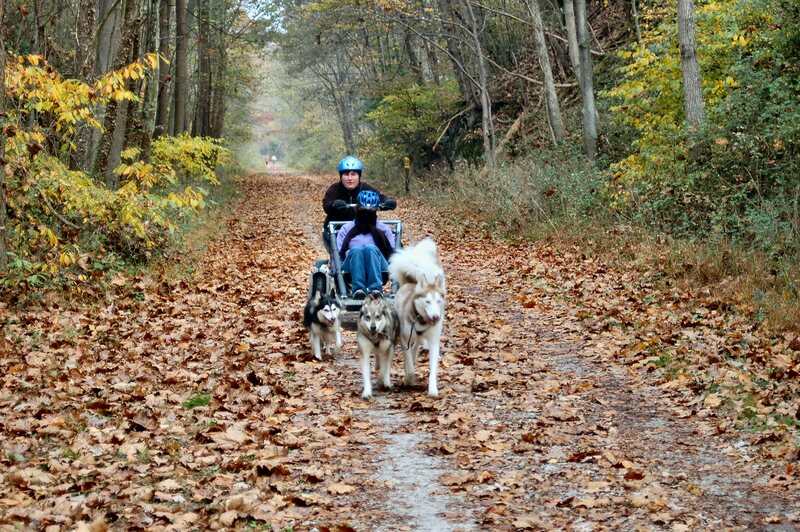 Sobo and Zoë smile for the camera as they run down the Torrey C. Brown rail trail. 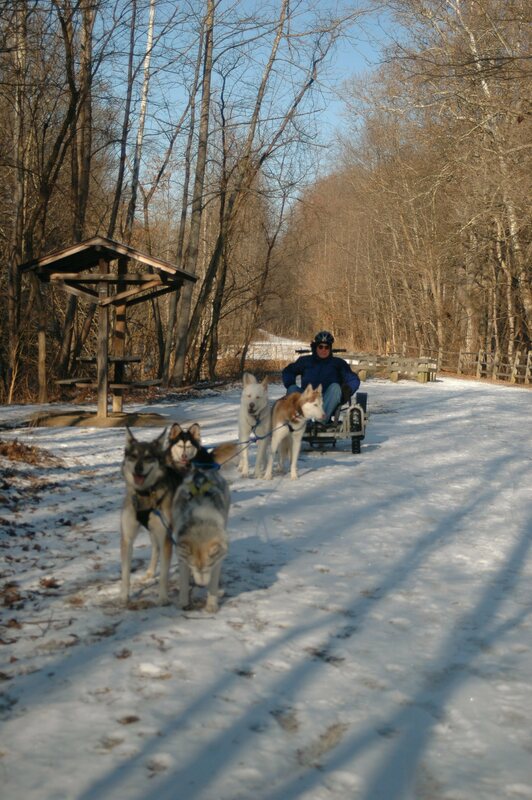 Greg looks towards Okemo and T-Bone as the sled dog team gets ready to start down the trail. 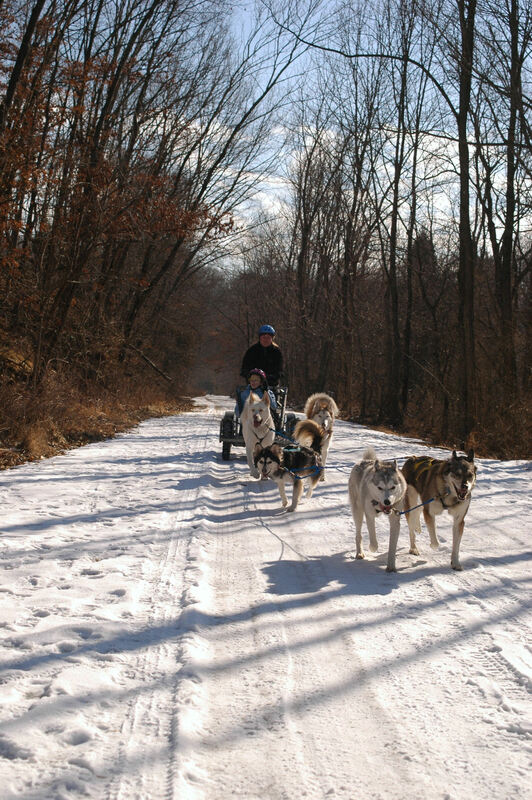 Greg and the dryland dog sledding team pause for a short break near the Gunpowder Falls. 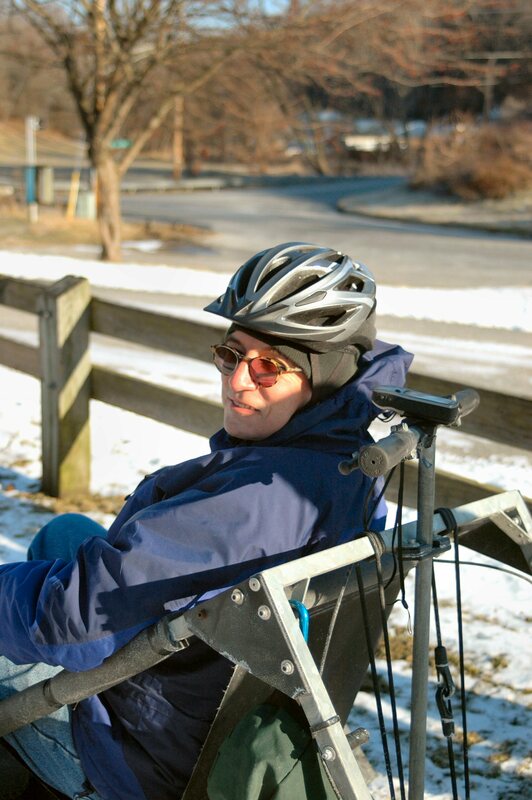 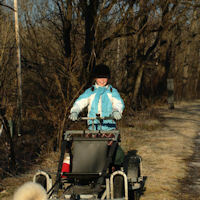 "It was the best day of my life", said Claudia after dog sledding on the Torrey C. Brown rail trail. 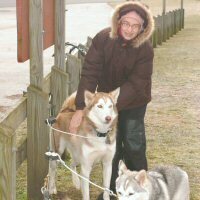 Claudia, from Harrington, Delaware, performed her civic duty and voted for dryland dog sledding on this Election Day! 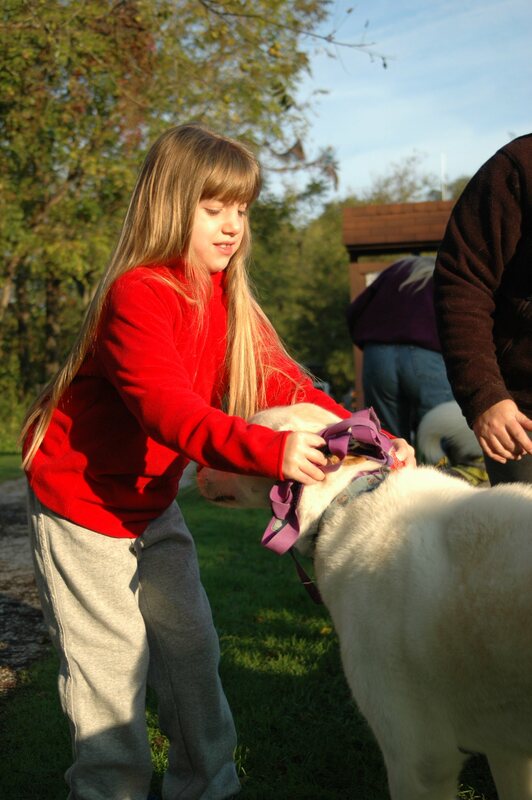 For additional pictures from this Yappy Hour, visit our webshots gallery. 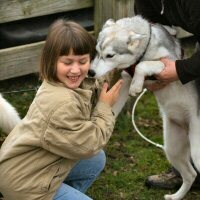 Claudia meets an excite Acadia. 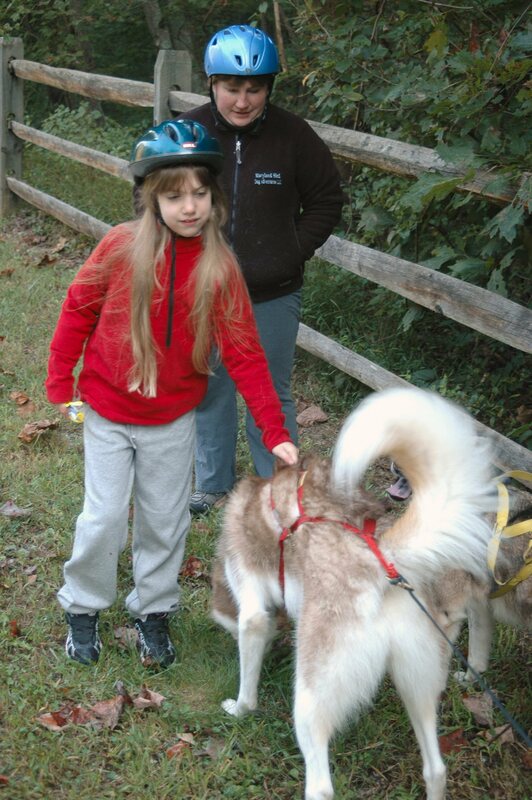 Claudia poses with Okemo's big purple dog sledding harness. 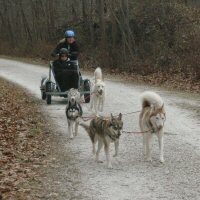 Wow, all this dog sledding is tiring! 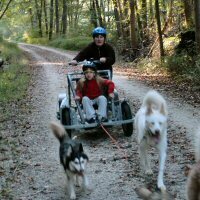 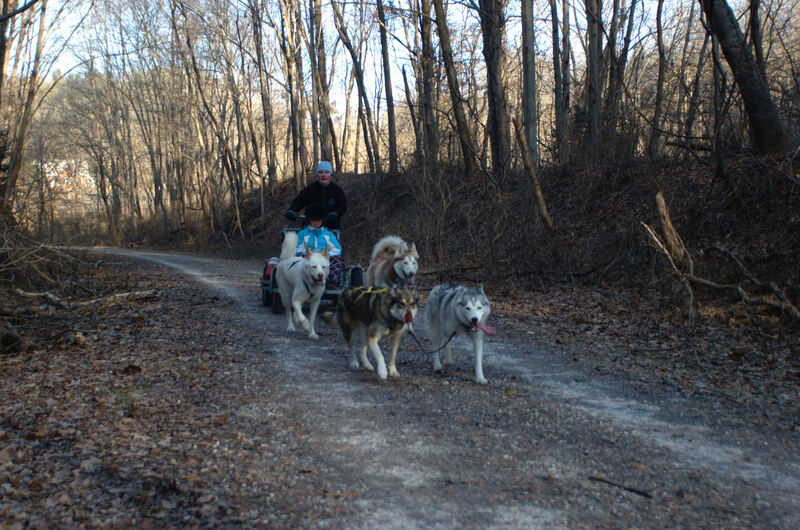 Claudia and the sled dog team race down the trail towards the Pennsylvania state line. 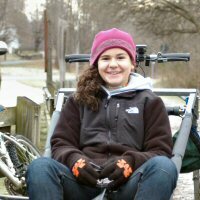 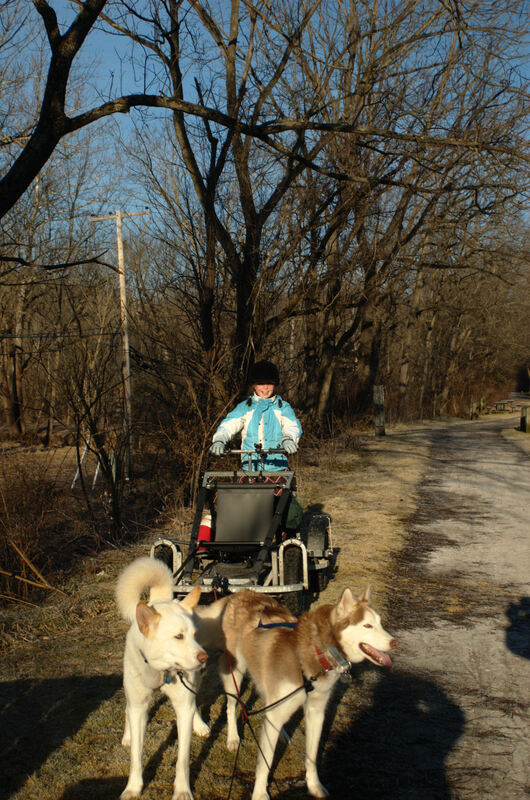 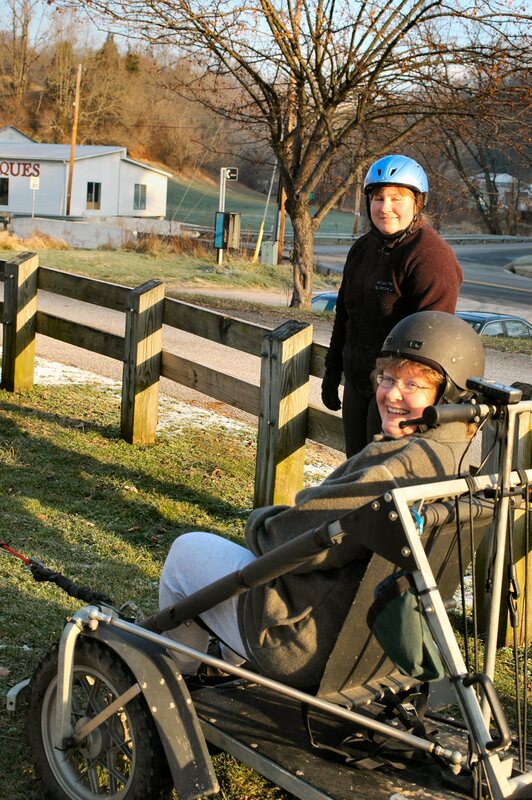 Christine came to Monkton station on the Torrey C. Brown (NCR) rail trail and learned about dryland dog sledding. 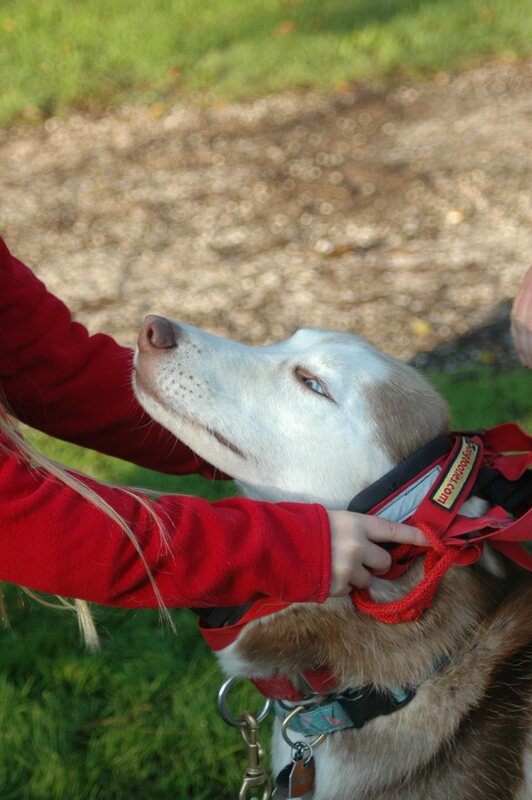 For additional pictures from this Yappy Hour, visit our webshots gallery. 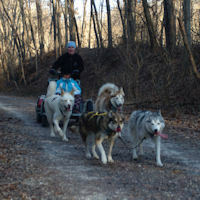 Christine from the passengers seat during the dryland dog sledding ride. 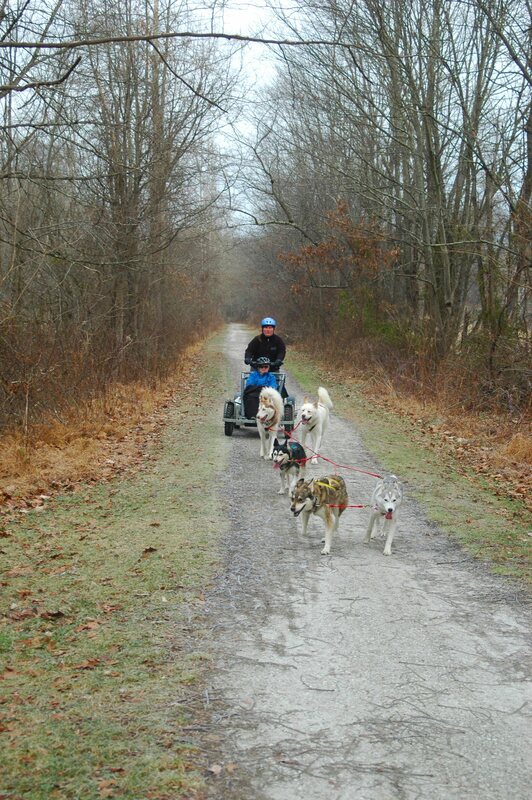 The team races down the trail. 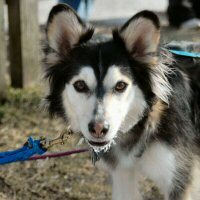 Okemo hopes that someone brought the treats. 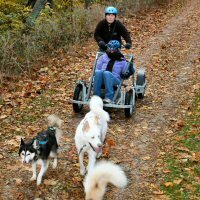 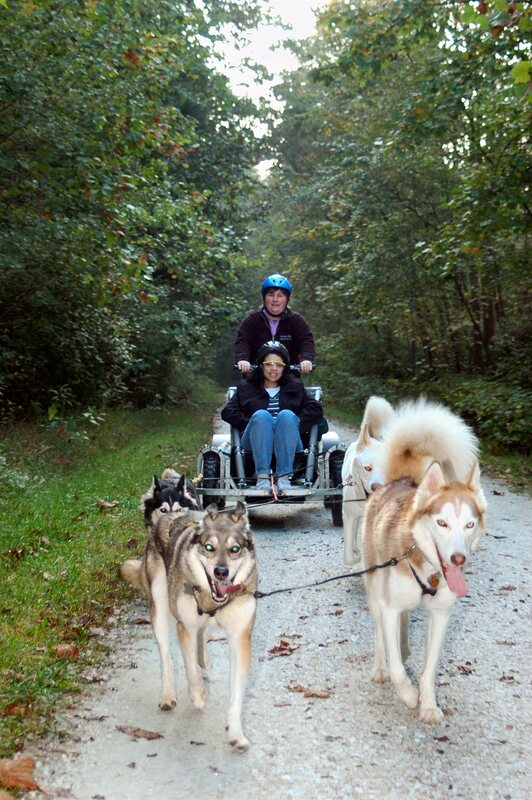 A dryland dog sled is an ideal way to see the fall foliage. 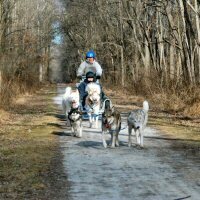 The weather cooperated and stayed just cool enough to allow Maryland Sled Dog Adventures LLC to run a Yappy Hour educational program. 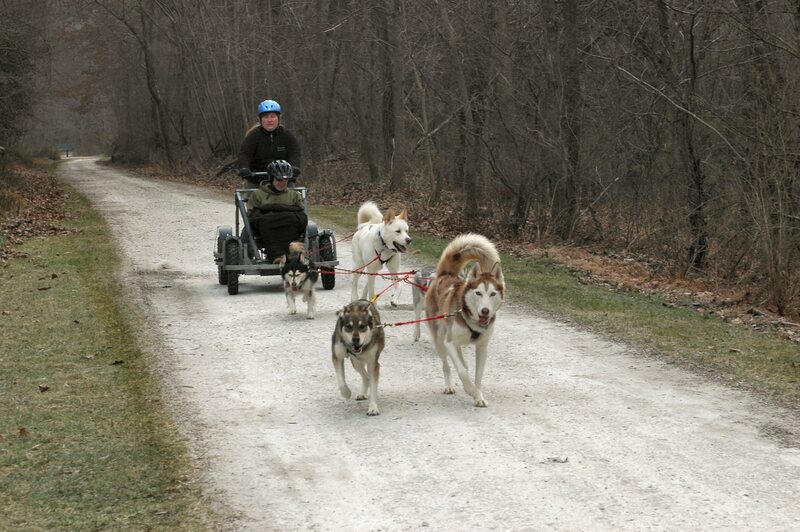 Our guest was able to learn a little bit about dryland dog sledding as she toured the Torrey C Brown rail trail. 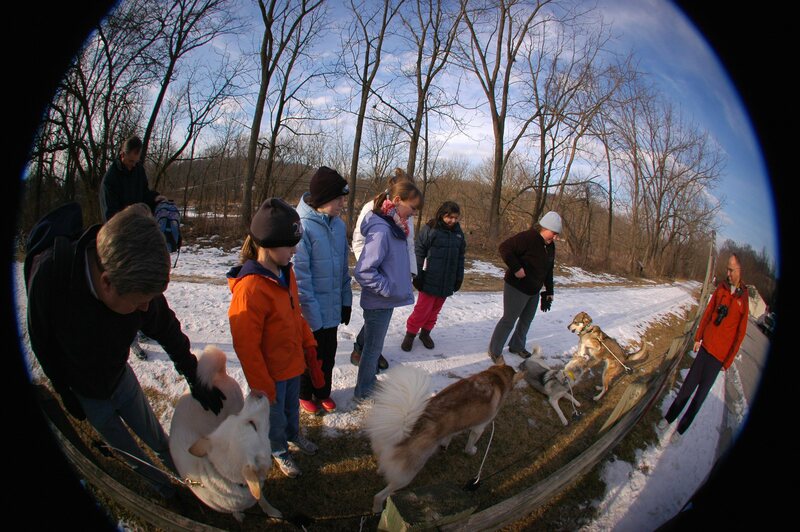 The Yappy Hour started with a meet and greet of the sled dogs. 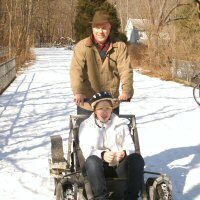 Here, Okemo gets harnessed. 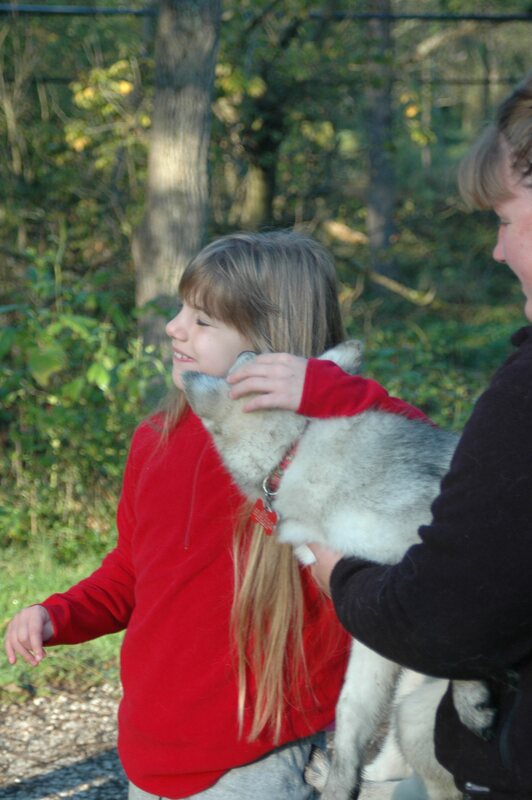 Zoë enjoyed meeting new people. This Yappy Hour included a dryland dog sledding ride through northern Baltimore county. 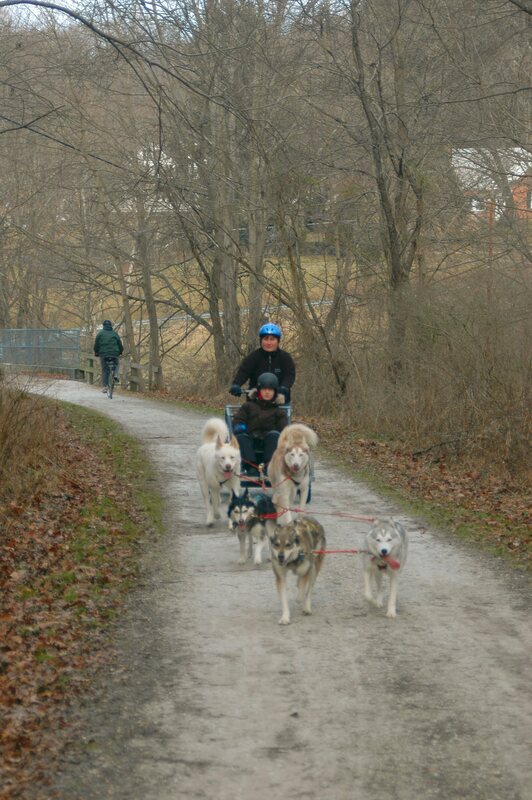 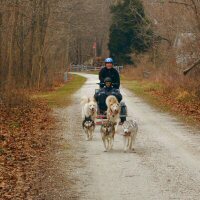 The sled dogs worked hard on this dog sledding ride on the Torrey C. Brown rail trail. 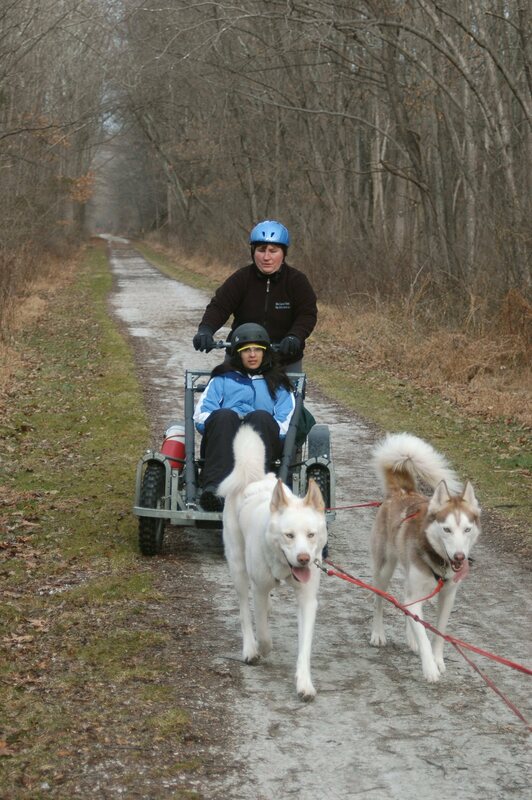 Alani came out and met the team of Siberian Huskies at White Hall to learn about dryland dog sledding. 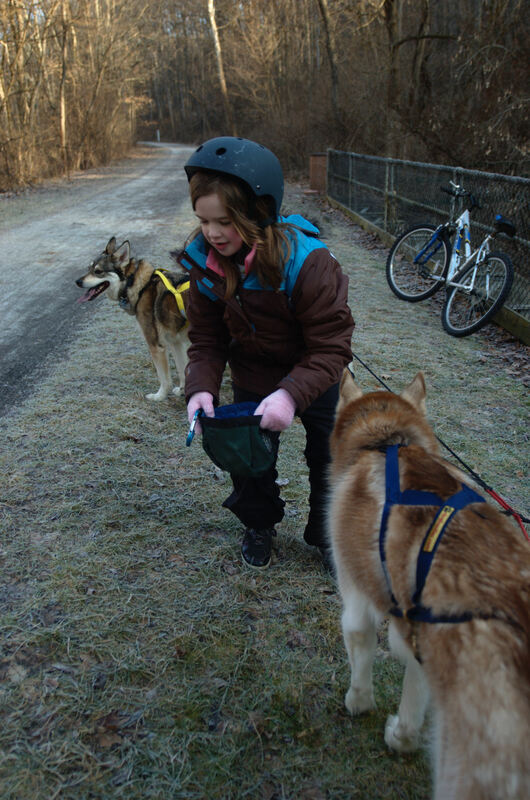 Eight year old Alani started her ride by meeting new puppy Acadia. 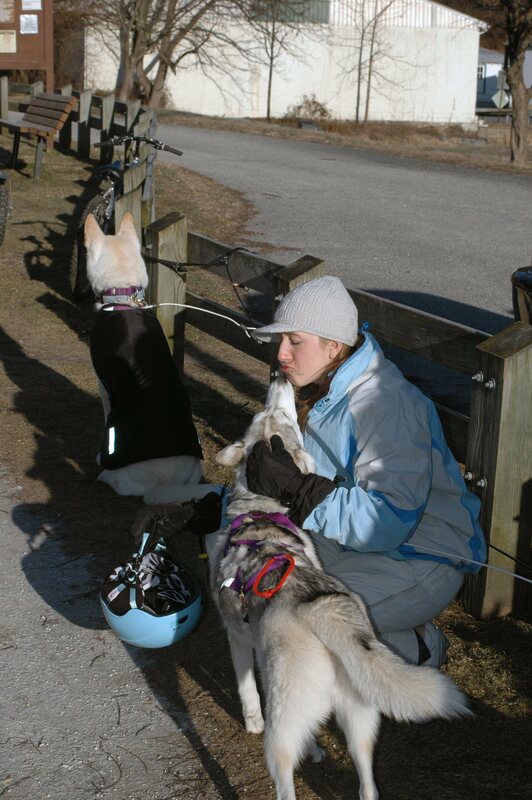 Alani tries to make the harness fit over Okemo's big 'hug-a-head'. 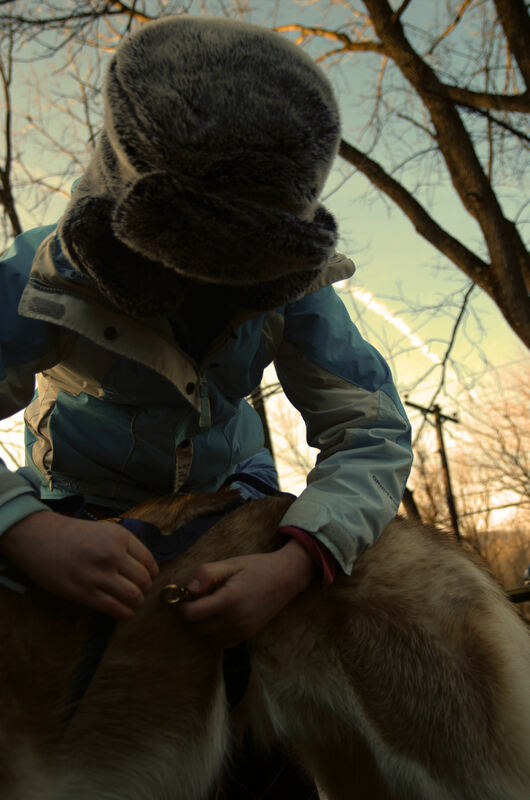 Sobo lays his ears back during harnessing. 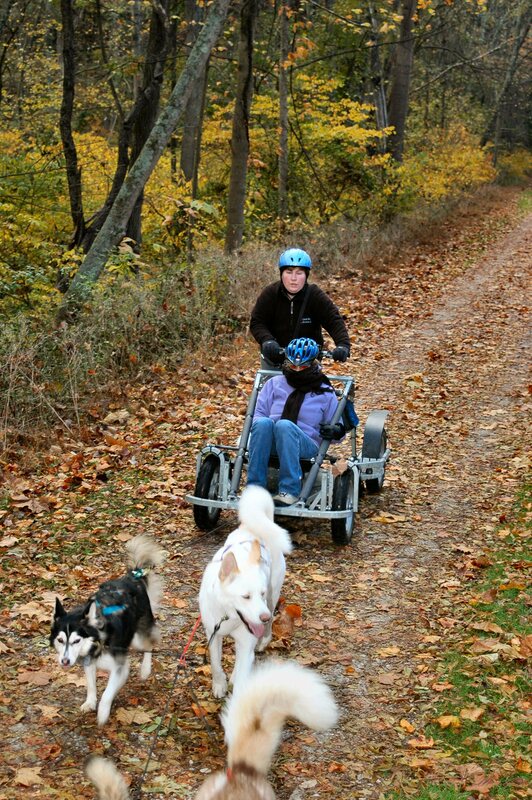 Alani and her team ride through scenic northern Baltimore county. 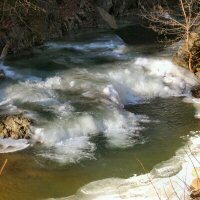 At the waterfall, Alani helped to water the dogs. 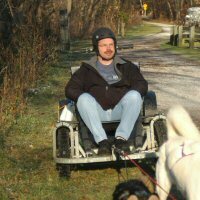 It's my turn to drive the team! 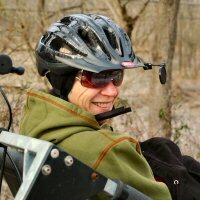 Additional pictures from previous years are available in last season's gallery.